If You Solve This In 30 Seconds You Are A Genius! This week's newsletter is all the AI craze or AI bubble that seems to be feverishly gripping both business and tech companies. Your Editor is going to offer his own take on AI and invites readers to share their own thoughts on these matters so we can include them in the Mailbag section of an upcoming issue. We also review a new book on biometric security from CRC Press, and Your Editor shares his recent success in weightloss using a new diet plan in the IT Pro Fitness Corner section of this issue. We also catch up on some amusing late responses to our Factoid of the Week from the last few issues. And finally we have the usual potpourri of tips, tools, links and fun stuff to make your day. Last week's Issue #1139 Retro IT obviously struck a chord with many readers based on the number of responses we received on this topic. We picked some of the best of these for inclusion in this week's Mailbag. I'm sure Bernhard's situation is similar to many of our readers who work in business environments where Microsoft Windows is the dominant desktop OS. As I mentioned in our last newsletter I still have parts of Office 2010 installed on at least one PC in our offices and IIRC we skipped over Office 2007 and went directly from Office 2003 to 2010 some years ago. We briefly used WordPerfect many years ago until we switched to Word 97 as our writing/editing platform. I did have a relative who used to work in a Lotus shop but I've never used Lotus as our productivity software, though I did once try to migrate a mail system from Lotus to an early version of Exchange. Old PC Magazine Utilities - UnClean, Registry Robot, EndItAll, FindOrphans, BHOCop, COA2, DaysEze LeftBrainGames - Virus Alert! Microsoft Office 2007 is still supported! Probably more, just don't know how old the apps are! Keyboards are one piece of hardware that users seem to get especially attached to. I used to be fanatical myself since I mostly write/edit for a living, but after having worn out numerous old IBM PS2 keyboards I finally just starting buying keyboards at random from Staples and found I could get used to typing on just about anything. Maybe that happens to you after you've written several million words. In fact I can touch type fairly fast with good accuracy even though I've never taken a typing course or used any touch typing software. Another HP calculator fan--cool!! Do you know about the Museum of HP Calculators? Now why can't Windows PowerShell let you code expressions in Reverse Polish Notation (RPN)? Everyone is talking these days about how AI (artificial intelligence) is going to change everything. Unfortunately however it seems most AI today is designed to either control people or make someone rich. What about AI that makes us more free? In the PC computing world we have the paradigm of client/server computing. In the earlier mainframe world it was more like master/slave. What I would personally like to have is not an AI "master" that controls my life and makes me consume and buy stuff from some company, but rather an AI "slave" that would do my bidding to actually make my life easier and less controlled by our corporate overlords. Oh great. Not only will this put a lot of writers and editors out of a job, it's going to generate a lot of news that I don't need or want to read. What I will probably be needing in the future is an AI slave who can learn what kind of news stories I'm interested in and then read all the news out there for me, digest it, and simply summarize what I need to know. "Wait, that's part of the service our AI Master technology is going to provide!" says the company developing this. "You'll be able to configure your preferences and our AI Master will watch what you read to learn what you're interested in. Then our AI Master will customize which articles are delivered to you--along with some relevant advertisements." Great but no that's not what I mean. I don't want You to decide what articles I might want to read. In fact, I don't even want to read your articles because there's too much fluff in them and too many advertisements. And I don't trust you anyways because you'll change your algorithms without notifying me, and you also won't divulge your algorithms to me. No, what I want is an AI Slave that I can order around and say, "Slave, read all the online news articles about space exploration and give me a one-page summary of what I'll find new and interesting--without ads." This hearkens back a few years to when Microsoft started using speech recognition technology when you phoned in to reactivate one of their products. I remember at that time thinking, "OK Microsoft you've saved yourself the cost of a real live employee, but instead of talking with a human being who could resolve my problem in two minutes I've had to use your stupid voice recognition "slave" for 15 minutes just to reactivate my software. I recall thinking at the time how cool it would be if I had a speech synthesis/voice recognition program as a "slave" which I could order around saying, "Slave, phone the Microsoft product activation number and reactivate my copy of Windows Server 2008." Now THAT would be a technological advancement worth owning! I think you probably got my point by now. What's on the top of your own wish list for AI? Do you think it will "change everything" the way so many tech pundits are saying? Are we in the early days of a rapidly expanding AI bubble? Do you think most of the money spent on AI is well spent, or is it mostly going down the drain? Email us at [email protected] with your thoughts and observations. I recently had an opportunity to get my hands on a copy of "Biometrics in a Data Driven World: Trends, Technologies, and Challenges". The book is a collection of essays that cover the basics of biometrics and some of the various ways that biometric technologies are being applied in such areas as health care, security, mobile devices, cloud computing, social media, and even in gaming and entertainment. Many of these essays offer fascinating insights that will be of interest both to IT professionals and IT decision-makers, and I highly recommend organizations that are looking at implementing a biometric solution to get a copy of this book before doing so. The book also includes a collection of real-world case studies of various mobile biometric solutions. Some of the technologies examined in these case studies include voice, face, and fingerprint recognition; biometric signatures; keystroke and gait analysis; and more. The book ends with an essay summarizing current and future trends in biometric technologies, and there's a huge list of references you can explore for additional reading on any of the topics you're interested in. A look at recent advances in how Microsoft protects users across Office apps and Windows 10. See how Windows Information protection now prevents unauthorized sharing of business data from managed Office apps to personal apps on your PC. Also, see how you can now protect users from malicious links in Office apps such as Excel and PowerPoint with safe links. Would you like to speak directly to Microsoft Security Engineering teams? Microsoft wants your feedback! Find out how you can influence the developers who write the code for security products and the technical program managers who design the features. Gain insight into product roadmaps, join discussions, request features, participate in private previews, and attend in-person events. Mitch, reading about your pains with pushing the exercise bike reminded me of some of my own experience. I'm ten years or more older than you and I had to finally come to the realization that the body can only be pushed so hard so long before it will very painfully remind us that it will make us pay for pushing too hard. I have had to back off on the intensity and duration of the exercise in order to be sure that I can continue to do the exercise. Old men hate to admit that we aren't what we used to be, but being able to do much of what we used to do even at reduced levels is better than not being able to do anything at all! 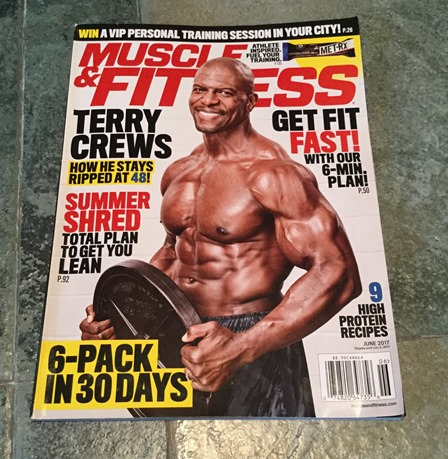 Terry Crews is a great guy so I bought the issue. I wasn't disappointed. While the details of his workout didn't teach me anything new, I was fascinated by the nutrition program he followed which he says he learned from Randy Couture. Terry says he eats all his meals each day within an 8 hour window which for him goes from 2 pm to 10 pm. Then he fasts for the remaining 16 hours of the day. This is a kind of intermittent fasting but it's different from the usual "fast two days then eat normally; repeat" intermittent fasting routing often touted in fitness magazines. So I decided to try it. I've generally been part of the big breakfast crowd for the last few years since most fitness experts say breakfast is the most important meal of the day. Plus I do my workout early in the morning before breakfast so my body is usually craving food to rebuild and repair itself after a workout. But I thought of Einstein's quote about insanity (which he probably never said) and decided Hey, why not give this a try? So I decided to eat my first meal no earlier than 10 am and my last meal before 6 pm. I do eat a piece of fruit or two when I wake up, and might have a spoonful of almond butter before bedtime for the magnesium to help me sleep. But about 90 percent of my calories are now consumed within this 8 hour window. I also decided to focus more on heavy cardio (e.g. exercise bike) than pure weightlifting for the next while, though I still have the occasional day where I focus on a body area like back or arms and give it a good blast. The reason I chose heavy cardio is because my appetite is much less after cardio work than after weightlifting. The result? I've lost 6 pounds in 6 weeks and mostly from around my midsection. And I find I don't feel hungry now after exercising and can wait an hour or two before eating, which is good because growth hormone elevates after a cardio session and this helps burn fat from your body. I'll be interested to see if I can continue this routine for the rest of the summer. I have had a couple of unplanned fall-down-flat "cheat days" like this weekend where I had pasta, pizza and ice cream, but I punished myself afterwards by cutting my calories drastically back the following day plus doing an hour and a half of cardio. Issue #1132: Do you know any more interesting acronyms of military origin than SNAFU? Issue #1134: What was the worst thing that ever happened to you when you relied on GPS to drive to some destination? Issue #1138: What are some other crazy things that radioactive materials have been used for in the past? Or today? Budget airline VivaColombia is considering plans to remove all seats from its planes and make passengers stand. What other recent news item have you read that seemed like it must be an April Fools' joke? The bomb was said to be 15cm long and filled with gunpowder. The teenager claimed to have forgotten it was in the bag after making it with a friend for fun some months before!! Question: Got any other amazing cooking tips to share with other readers of this newsletter? After all, IT pros need to learn how to cook so they can eat healthy instead of living on a diet of potato chips and soda pop. Backup plans are critical, but the choices -- private server, cloud, hybrid approach -- are daunting. Here’s what to look for in a server backup solution. Operations Manager is a key part System Center Operations Manager. In this article, we will show you how to deploy Operations Manager on a single server. This article concludes the discussion of storage replication in Windows Server 2016 by examining a PowerShell tool for testing the replication topology. In this step-by-step tutorial and guide, we will show you how to deploy SQL Server 2016 to support System Center Operations Manager 2016. Cyberattacks can bring down any business quicker than their worst product and best competitor. These top cybersecurity measures can help you avert disaster. What if you could improve tech training and save money at the same time? The flipped classroom model can do that, and more, for tech education, Joseph Flahiff says. The Microsoft recently expanded PowerShell to support the Linux OS. Discover key differences in the open source version of PowerShell, ranging from commands to script creation. A remote code execution vulnerability in Apache Struts 2 affected four VMware products. Keeping a VMware environment secure goes beyond basic features and tools. Do you have the potential to be a genius? Find out now! In this age of possibility. we can ask more from our buildings than ever before. The buildings of the future will be shaped by you!